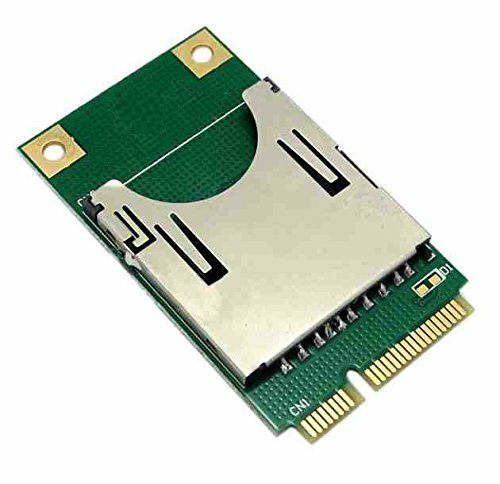 The MiniCard adapter for SD card is very low-cost SSD and Ready-boost solution for laptop computers. Your SD card can easily into the MiniCard slot of newer laptops or embedded with mini-card adapter. The adapter was the best of the external drives. Solid State Drive (SSD) that delivers extra memory and reliably backs up your important data without cables and the protrusion of other, more awkward external storage devices. The adapter is a USB 2.0 SD/MMC Flash Card Reader single slot. It supports USB 2.0 high-speed transmissionto Secure DigitalTM(SD), SDHC, SDXC, miniSD, microSD (T-Flash), MultiMediaCardTM(MMC), RS-MMC,MMCmicro, MMCmobile on one chip. As a single chip solution for USB 2.0 flash card reader. 1.Designed for use with laptop or embedded computer. 2.Super low power consumption and light weight, comparing to traditional HDDs speed and computer configuration. 3.Compatible with Windows and Linux. The adapter is standard USB mass storage device. Design for Extension/Secondary HDD. Application for readyboost and backup/Storage function. Basically, this adapter can't bootable to Windows XP/Vista. Super low power consumption and light weight, comparing to traditional HDDs speed and computer configuration. If you have any questions about this product by YLYZQR, contact us by completing and submitting the form below. If you are looking for a specif part number, please include it with your message.